Our unique Pentecost Land Diving Tour involves the famous Land Diving, which only takes place between the months of April – June. 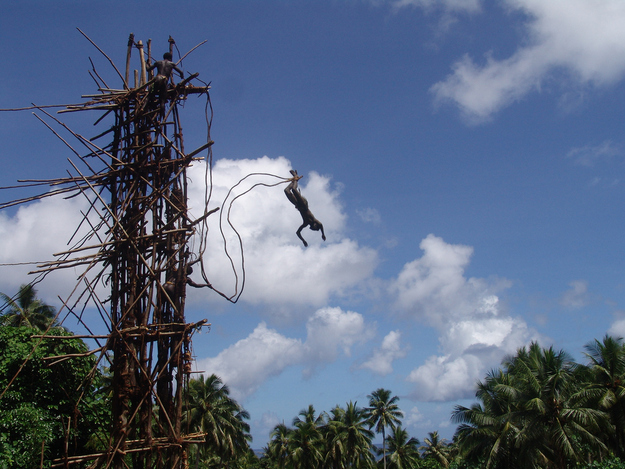 This is the original bungee jump and is referred to as “the nangol”, an ancient Melanesian tradition involving both men and boys (some as young as 7 years old) diving head first from a makeshift, wooden tower from heights of up to 100 feet over land with only vines strapped to the ankles to break their fall. Land Diving is extremely dangerous but for centuries, this ceremony has been performed by Pentecost Land Divers to prove their manhood and as a fertility rite to ensure a successful yam harvest. The practice continues to this day and is one of the most spectacular and impressive events in the Pacific. Ritual washing of the divers, last minute words or prayers for a successful jump and men, women and children stomping the ground, performing 'kastom' dances, singing and chanting throughout this extraordinary ceremony make for an awesome experience. The 'Nangol' is a sacred ceremony and the privilege of witnessing this unique event is only extended to a limited number of tourists or outsiders each year. This fact, the thrilling nature of the 'kastom' ceremony itself, and the “seasonal” nature of this tour means that you need to book this tour early or risk missing out altogether! Get picked up from your hotel and driven to the airport at 8am. The flight leaves Vila at 9.00 am and flies over Efate where you take in the view of pristine jungles, tropical mountains, rivers and villages. As you fly past the coast you will see reefs and the magnificent blues of the shallow waters that ring the island. Enroute to Pentecost there will be a scenic overfly of 3 volcanoes; Lopevi Volcano along with Marum and Benbo volcanoes on Ambrym. Make sure you have your camera ready! We arrive at Lonororoe, on Pentecost island, at 10.00 am where the local villagers will give you a traditional welcome. The jumps will commence soon afterwards with between six to ten jumps open for the public. Once the jumps are finished you’ll have a chance to eat local snacks before heading back to Port Vila. There is an additional 200 Vatu departure tax payable at Port Vila airport. As ATMs are not available on Pentecost, please ensure you carry cash for any purchases you may wish to make. * Note: that itinerary and trip times are approximate and may be subject to change. Prices in AUD approximate based on current exchange rates.